A radio frequency band used for mobile phones in the US. As one of the newest bands, it's used exclusively for newer technologies such as LTE, a 4G technology. Band 66 is also known as AWS. Band 66 includes band 4. It is an expansion and superset of that band. Band 4 included AWS blocks A-F, as part of the AWS-1 auction. 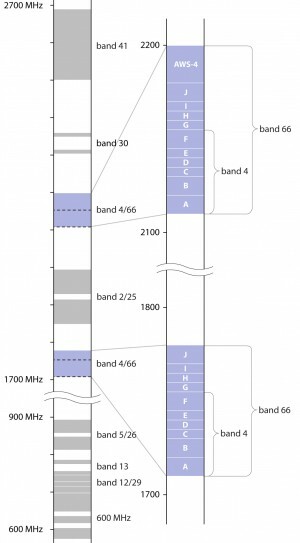 Band 66 adds blocks G-J (AWS-3) and the unique AWS-4 block. AWS-1 and AWS-3 (blocks A-J) are paired bands, meaning phones transmit to towers on different frequencies from what towers transmit to phones on. This prevents interference. AWS-4 is an unpaired band, making it suitable for one-way communication. As part of band 66, it's intended to be used in conjunction with the rest of band 66 to boost downlink bandwidth (download speed). That makes band 66 asymmetric, (more of it is set aside for downlink than for uplink,) which is unusual. T-Mobile launched band 66 in late 2016. AT&T and Verizon also own AWS-3 spectrum, and thus may launch band 66 in 2017.